A “for purpose” venture to support mothers sparks a social solidarity movement. I met Julie Neale a couple years ago at Podcast Movement and we became instant friends. A devoted mom on a mission to create a meaningful life for herself alongside and integrated with her role as mother, she supports other mom’s to live what she calls an E.P.I.C. life. You are mindfully engaged with your children and family. You are passionate & purposeful, making a difference beyond your family. You are invested in yourself. You are connected to a strong support network so you are in community on the journey. You’re invited to be part of a year-end gratitude experiment! If you feel grateful for podcasts or podcasting, I would love for you to be a part of my upcoming December episode. Send me a short audio clip (3min or less) with a story and/or post on Instagram about how you appreciate making or listening to podcasts using #podcastgratitude. Be sure to tag me @andreaklunder so I see it! To share the audio clip, message me directly andrea [at] thecreativeimpostor.com and I’ll give you instructions. Let’s launch your show together as part of an intimate group in the Podcast Envy Launch Pod — the hands on attention of my private 1×1 launch service for a fraction of the cost! Julie pulled me on board for this ambitious heartfelt initiative she founded that year called Women Podcasters in Solidarity — a collective of women podcasters who have made a pledge to build awareness and funds for social justice through their podcasting platforms. This is a twice-yearly, ongoing initiative with the first focus being on Anti-Racism and the Movement for Black Lives, and the second on Gun Safety with an Intersectional Lens (you can join now for the new season here). I’m planning to contribute a series of episodes my high school podcasting students produced about gun control with Dion McGill of the Illinois Council Against Handgun Violence for Power Your Story. In this episode of Podcast Envy, we talk about social justice, gun violence, the origin story of Mother’s Quest, how Julie produces her podcast, and finding joyful moments. I mean, you want to make a show that matters right? You’ve got a message, a passion, a purpose. How can you make sure it’s landing? These questions from your Podcast Boss (me) will help! Get the questions! 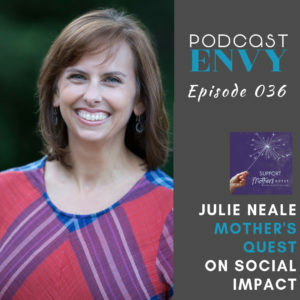 Mother’s Quest Founder, Julie Neale honors both the meaning and the mess of life and parenthood and believes our children and youth challenge us to grow into our best selves. She is on a mission to live a truly E.P.I.C. life and, through her example, inspire her children to do the same. 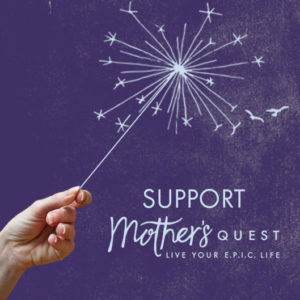 Her “for-purpose” venture, Mother’s Quest, provides inspiration, coaching and community so that mothers, and those who work with young people, can connect to support and resources, fulfill their unique purpose, and live their E.P.I.C. lives. Through this and her parenting experience, she realized that mothers, and those who mother, need an opportunity to reflect on their own growth, dreams, and plans and created Mother’s Quest to champion them. With calm and care, she masterfully taps into her own curiosity and intuition, to help her clients slow down from the busyness of life and work, reflect on what matters, clarify a future vision, and move into action. She writes about the transformative experience of parenting in her own life at mothersquest.com and in the Mother’s Quest Facebook community and hosts the Mother’s Quest Podcast, which launched in December 2106, recently releasing its 50th episode. In the fall of 2017, she founded the Women Podcasters in Solidarity Initiative, to raise awareness and dollars for social justice issues through the power of podcasting. The first season focused on anti-racism and police accountability. The episodes of those who contributed, including three from Mother’s Quest, can be found at www.womenpodcastersinsolidarity.com. A fall 2018 season is focused on gun safety with new episodes to be released in January 2019. Julie received her Masters in City Planning, Community Development from UC Berkeley and a BA in Communication Studies from UCLA, where she met her husband. She currently lives with her husband and two boys in the San Francisco Bay Area. 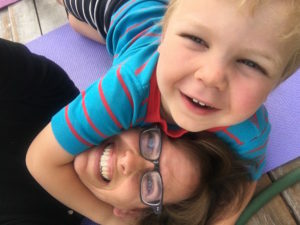 When she’s not wrestling with her kindergartener or driving her teen to basketball practice, you can find her squeezing in ten minutes of yoga and meditation (believing something is better than nothing!) and staying up way too late to watch a double-hitter of the Handmaids Tale and Super Soul Sunday. This entry was posted in Authenticity, Collaboration, Community, Featured, Podcast, Podcast Envy, Podcast Envy Episodes, Self-Care and tagged podcast, Podcast Envy by andrea. Bookmark the permalink.